Welcome to the American Friends of Elon Moreh website. American Friends of Elon Moreh exists in order to support and provide for the security of the Israeli town of Elon Moreh. Elon Moreh-Shechem was the first stop of Abraham in the land of Israel, the spot where G-d first promised the land to him and his descendants, the Jewish nation (Gen. 12:7). Later Jacob bought land in Shechem and his son Joseph was buried there. This was the first stop of the Jewish People when they entered the land, where they sealed their covenant with G-d at Mt. Grizzim and Mt. Ebal (Deut. 11:26-32, Joshua 8:30-35). Today Elon Moreh is the fulfillment of G-d's age-old promises to the Jewish People. The families that live here, along with the many friends that help Elon Moreh grow, are aware of the importance of the renewal of Jewish continuity in this area of Israel. The historical and religious significance of the area has been the driving force for the reestablishment of the Jewish presence in the Shomron, particularly in Elon Moreh. 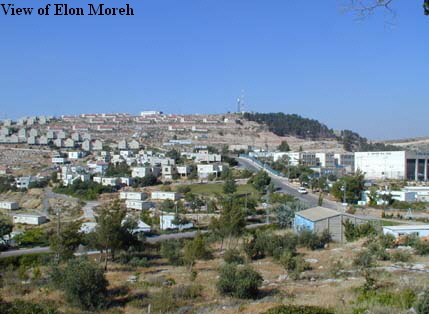 Elon Moreh has 250 families living in a self-governing municipal community. More families are joining and, together with the support of their friends, are building a modern society on the very spot where the Land of Israel was promised to the Jewish People. The residents have come from all over the world to live together and raise their families in Elon Moreh. A special emphasis has been put on establishing the many educational institutions - preschool, kindergartens, grammar school from 1 - 8th grades, kolel and rabbinical seminary, women's teachers seminary, high school for Russian immigrants, and a field school for seminars on Bible topics and trips to historical sites in the area. The community has its own medical and dental clinics, post office, supermarket, and several retail stores. There is a sports center and an outdoor swimming pool, a public library, a senior citizens center, and a youth center. The community has several synagogues and two mikvahs. Most of the residents are employed in Elon Moreh, but some commute to nearby towns. Elon Moreh has business opportunities with its own industrial park and a status of A+ development area. Elon Moreh will continue to be at the forefront of the movement to strengthen the Land of Israel with long-range plans for building a major city.